DOWNFALL OF GAIA hitting the road in March 2017 as direct support to CONAN! New album ‘Atrophy’ out now! 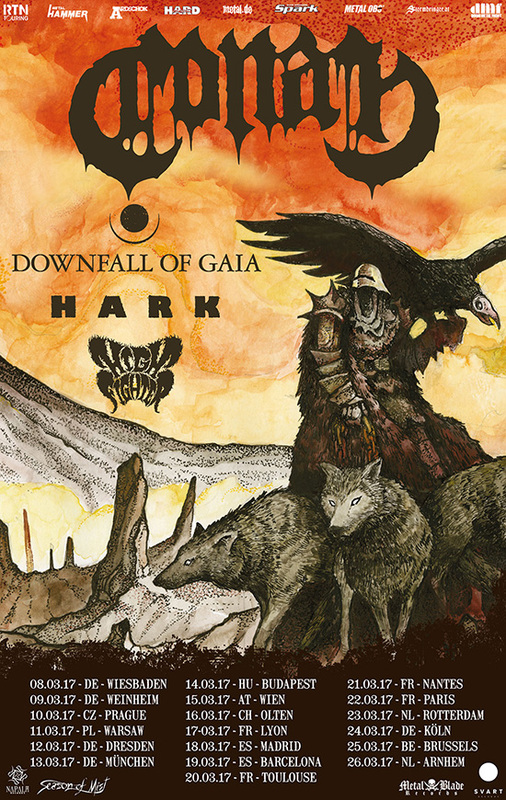 DOWNFALL OF GAIA released their latest album ‘Atrophy‘ just recently via Metal Blade Records. Make sure to surf over to metalblade.com/downfallofgaia to watch, listen and enjoy the video for ‘Ephemerol’! At the same location you can order the album on vinyl, as a Digi-CD or as a bundle with an exclusive T-Shirt! Now DOWNFALL OF GAIA has announced a full European run in support of ‘Atrophy‘! They will head out together with CONAN to give ‘Atrophy‘ to the masses! 17/03/17 FR – Lyon – t.b.a. ‘Atrophy‘ was recorded at the Hidden Planet studios in Berlin together with Jan Oberg and mixed and mastered by Jack Shirley from the Atomic Garden studios in San Francisco.